The name of I. I. Sikorsky is already familiar to the British public and his giant aeroplanes have frequently been discussed and explained in the British Press. Sikorsky has been responsible for a genuine revolution in aviation, and he has succeeded in finding a solution for a problem which was regarded by the majority of aeroplane experts as utterly insoluble. The great Russian aviator and inventor is only thirty years old, and his youth lends additional interest to his personality and his career. He is the son of Professor Sikorsky, a well-known physicist and he received his technical education at the Kieff Polytechnic. He began to take an interest in aviatIon some six years ago, and he became one of a small circle of student aviators. His initial experiments were made with the appliances known as "helicopters." In those early days Mr. Sikorsky believed in the possibility of constructing a machine of the vertical lift type, but he very soon discovered that this was not practical. This disappointment, however, did not in the least diminish his energy and enthusiasm. He designed and built a small machine somewhat similar in form to the Bleriot monoplane. It jumped rather than flew and Sikorsky's fellow students nick-named it "the hopper." In the autumn of 1910 Sikorsky built his first tractor biplane and after a series of further experiments he built several other machines of the same type and these were warmly approved by the recognised aviation experts. The originality and energy of the young inventor soon attracted the favourable attention of the Russian technical authorities, and the famous Russo-Baltic Works financially supported him in the building of his improved type of tractor biplane. In 1911 Sikorsky took part in the first military aviation meeting in Petrograd. The machine he entered was unsuccessful, the prize being won by Gakkei. This failure caused Sikorsky to make still further improvements in his machine and two of them were entered at the second military meeting, one a tractor biplane and the other a monoplane. 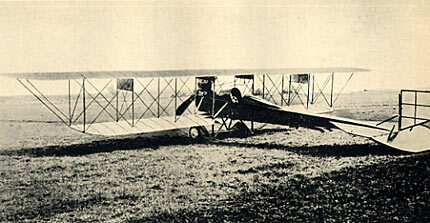 Sikorsky piloted the biplane, and this time he won the first prize. This success naturally acted as a stimulating encouragement and by it Sikorsky was emboldened to take his designs for a giant aeroplane to the directors of the Russo-Baltic Works. For a long time the possibility of constructing a large type of machine had been discussed by the Russian experts and they were unanimous in their belief that it could be accomplished. Sikorsky, unlike most inventors was very happily placed in regard to finance. His father was a rich man, and he himself had sufficient resources to make it possible for him 'to carry out the necessarily costly experiments without, help. His relatives recognised his ability and to some extent became his partners, and the Russo-Baltic Works continued their aid. But despite all these favourable conditions the expense he had to meet was so great that he, in common with so many of his fellows, suffered from serious money troubles before he finally attained success. In the winter of 1912, for example, he was to be seen in the Petrograd streets wearing a thin overcoat bought for twenty-six roubles from a cheap ready-made shop. Everyone who has experienced the rigours of a Russian winter will understand that this was not done for pleasured or for the mere desire to be original. Above: Chief mechanics of the Imperial All Russia Aero Club. 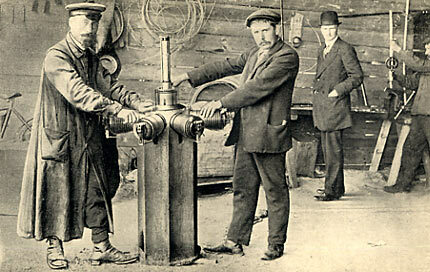 Messrs. Odinzoff and Kisseloff trueing up a "Gnome" engine. Sikorsky was greatly helped by a well-thought out series of scientific researches made in the aero-dynamic laboratory of the Petrograd Polytechnic. He gave his whole mind and soul to the task he was undertaking, and in the spring of 1913 his first giant aeroplane was ready to take the air. There was considerable scepticism among aviators as to whether the giant would after all be able to fly. The success of the trial flight was, however, complete. The giant flew perfectly well with its engines running at half power. It presented a beautiful and majestic sight. The span of its wings was twenty-eight metres with a chord of three metres. The length of its body was about nineteen metres. The front half of the body included comfortably arranged cabins and the body had a deck of about one and half square metres. In constructing his machine Sikorsky had been influenced by the ideas of Mr. Steglau, which I have already described in a preceding chapter, and the entire body of the aeroplane was constructed of three-ply wood. .The landing chassis or under-carriage was very strong - in fact it was discovered that it was too strong - and had eight wheels of the Nieuport type. The power was derived from four one-hundred h.p. German "Argus" engines driving four tractor air screws. Notwithstanding the fact that the aeroplane weighed about four tons, it flew well with, as I have said, only half its engine power. In the summer of 1913 Mr. Sikorsky entered this giant which he called "Russky Vitiaz" (the Russian Knight) at the third Military Aviation Meeting" during which he made some remarkable flights and beat the world's record for weight-lifting by aeroplanes per square foot of wing surface. The career of the "Russian Knight" came to an untlmely end during the competition through a very unusual accident. One evening towards the end of the meeting Sikorsky was preparing his giant for a flight while the well-known aviator Gabavlinsky was in the air experimenting with a new pusher type of monoplane built by the Dux Works at Moscow. During his flight Gabavlmsky's eighty h.p. Gnome engine fell out of his aeroplane from a height of about a thousand feet, and crashed through the wings of the unfortunate "Russian Knight." Gabaylinsky owed his life to his skill as a pilot and he planed down to the ground without the smallest damage. He was afterwards asked by the people who had watched his achievement if he knew that he had lost his engine. He replied that he did not know of the loss until he had reached the ground. He had suddenly felt the aeroplane become light at the back and he was surprised that he did not hear the engine, but he merely thought that it had stopped and at once planed down to the earth. The two wings of the "Russian Knight" were totally wrecked, and Gabavlinsky was equally astonished at the damage his engine had wrought and at the quiet unperturbed manner in which Sikorsky accepted his misfortune. Sikorsky did not attempt to repair the "Russian Knight," which he never regarded as more than an experiment, but immediately after the meeting, at which he had won both tint and second prizes, he began to construct an improved type of giant. He finished this machine in December 1913, but to his great astonishment it refused to fly. After making certain alterations he succeeded in getting a very good flight out of it. This second giant was the famous "Ilia Mourornetz." The span of its wing was thirty-two metres with a chord of three metres. The length of the body was twenty metres. The " Ilia Mourometz" presented a very peculiar appearance. The front of the body was flush with the front of the wings. The body and the under-carriage were constructed on an entirely different design to that of the "Russian Knight." The body instead of being completely made of three-ply wood was merely webbed with three-ply and covered with canvas, which of course made it considerably lighter. It had a series of cabins which extended for a little more than half its length after which a gangway led to the extremity of the tail, where a short ladder and trapdoor gave entrance to the tail deck. This deck was very small, and was only used by the mechanics to regulate the tail plane and the rudder wires. The main deck was in the middle of the body and it was constructed to carry machine-guns and searchlights. A third deck was fixed to the under-carriage and here, too, there was room for a machine-gun or a searchlight. The aeroplane had four landing wheels. Sikorsky succeeded in getting much better results from his second than from his first giant and during the spring, of 1914 he made many noteworthy flights. The power plant consisted of four engines developing up to five hundred and twenty h.p. The speed of the aeroplane was about one hundred and five kilometres an hour and she could carry a load of two and a half tons, though as a matter of fact she rarely carried more than one ton and three-quarters. Sikorsky fIew on this machine from Petrograd to Kieff, from Kieff to Libau, and from Libau to Petrograd. The War Office was very interested in the "Ilia Mourometz" and General Souchomlinoff gave Sikorsky the most generous encouragement and assistance. The Emperor presented him with a decoration and a money prize, and it was suggested in the Duma that ihe should be given a public gift of a hundred thousand roubles. The war broke out and Russia discovered what a valuable asset she had in Sikorsky. The War Office possesses more than fifty of his giants, and they have done invaluable service on the many fronts. It is considered by many as a great honour to be chosen as a Sikorsky pilot and many of the most accomplished of ithe Russian naval and military aviators now command the various giants. One of them is a well-known Russian sportsman who several times competed for the King Edward Cup at the Horse Shows at Olympia. This is young Captain Voievodsky of the Empress Maria Feodorovna's Regiment of the Cavalry of the Guard. This young man beat all Russian records by learning to fly on a Farman biplane in an hour. Owing to the difficulty of obtaining materials some of the modern Sikorskys are slightly smaller than the "Ilia Mourometz" and have' only two engines, some of which are more than two hundred h.p., which is an improvement over four engines developing only the same power. Sikorsky's great ambition is to make his giant aeroplane a perfect means of, transportation, and it is his keen grief in this hour of his country's need that Russia has not the same manufacturing facilities as Great Britain happily possesses. If it had, one would hear far less about Zeppelin raids in Russia. Sikorsky indeed has saved Russia from much possible Zeppelin damage, the commanders of the German airships having a reasonable fear of the giant aeroplancs piloted by dare-devil Russian officers. It will be remembered that the Zeppelin was little employed by the enemy during the great German advance into Russia, although they could unquestionably have been of the greatest service. While the German armies were advancing into Poland, the Zeppelins had to content themselves with dropping bombs on London and on undefended towns on the English coast. I do not think I shall be accused of being unduly patriotic if I add that if Great Britain had produced a Sikorsky these raids also would have been impossible. The giant Sikorsky aeroplane flies practically as safely during the night as during the day.